FASTJET airline has introduced its credit and debit card payment solution using Visa and MasterCard and expect to increase sales by 15 per cent, though mostly from overseas bookings. The airline understands that the credit and debit cards usage is not high in East Africa, with less than 10 per cent of the population in the region having cards, but launched the solution ahead of demand on this market. “We have been inundated with requests from outside Africa for people looking to purchase seats on the FastJet website, andÉ we are now in the position to be able to facilitate these bookings,” Mr Bodin said in a statement yesterday. The deal allows consumers and travel agents from across the globe the ability to access and pay for seats of the rapidly growing airline. “The solution that accepts Visa and MasterCard holders was launched and is available on the airline’s website This coupled with our hugely popular Mobile Money payment facility really means that our customer base has the full suite of payment processes available to them,” Mr Bodin added. 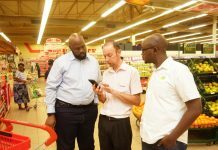 FastJet expects up to 15 per cent of future bookings to be made using credit and debit cards with Mobile Money payments already accounting for as much as 25 per cent of sales. Wirecard Executive Vice- President Travel and Transportation Jorg Moller said Africa is a very interesting market as “our strength and competence” in international payment and risk management solutions are especially valuable here. “Our solutions help airlines to operate their business more efficiently and at low risk,” Moller said. Wirecard AG (until April 2005: InfoGenie AG) is a global financial services and technology company headquartered in Aschheim, Munich, Germany. Last week the no-frills airline announced its 100,000th passenger since commencing flights from Dar es Salaam late last November and expansion of its frequencies to add two more daily routes from Kilimanjaro to Zanzibar and Kilimanjaro to Mwanza.